What is the function of art? ….and how do hairstyles and a whole load of other things fit into these discussions. If you didn’t hear it last week or haven’t come across it since, Eno’s calm and eloquent promotion (because it certainly isn’t a defence) of the significance of the arts makes for engaging listening. The forty-five minute presentation on how and why art and culture in its broadest sense is so important to us and why it shouldn’t be underestimated in its relevance touches on a multitude of references. Eno looks ahead towards the future and possible changes ahead of us raises so many points for discussion. 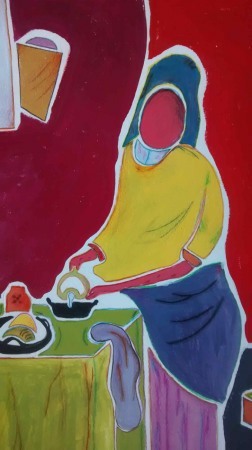 Art offers an environment to consider issues and subjects that we may not otherwise come to. But above all, art in all its forms is about engagement with one another and engagement ourselves. If you have a long train journey coming, a large pile of washing up to do or simply time for a glass of wine take the time to listen. 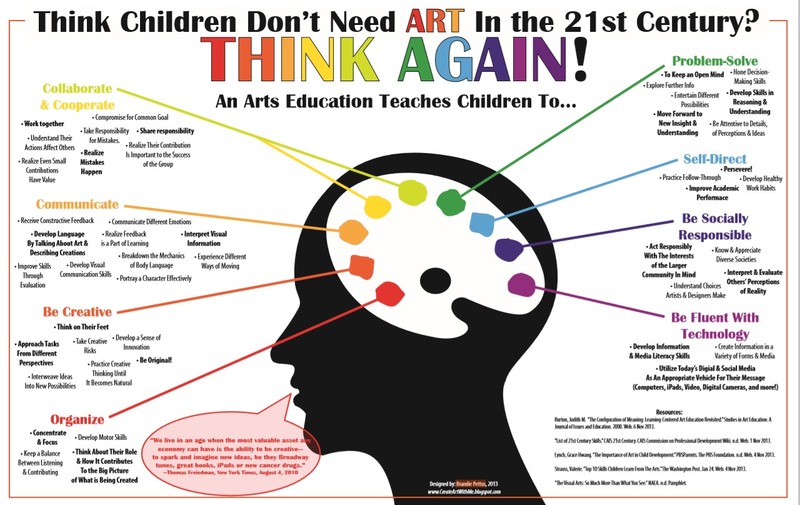 There are plenty of art teachers who will recognize the following situation, it’s one that I see particularly in the younger pupils (aged 12–‐14) that I teach. A painting assignment is finally finished and is being handed in after several lessons work. There are a number of immaculately made paintings, extremely neatly and carefully completed. However the works lack imagination and creativity. Pupils have relied very much on the approaches they know well and haven’t explored other possibilities as well as they could have done. There are also other works made by different pupils that are rather untidy and perhaps carelessly made in terms of technical execution. However this second group shows great evidence of creativity and invention. 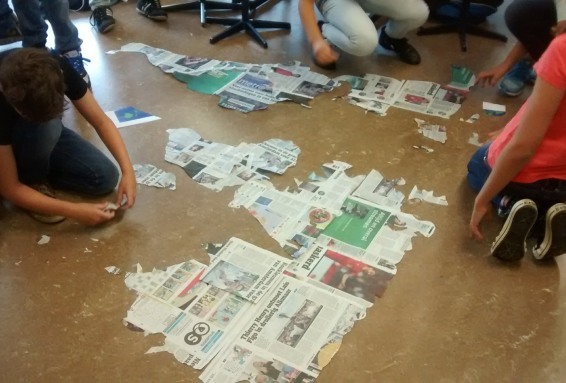 The pupils have thought hard about the assignment in relation to content, but the technical facility of the pupil has let them down in the final finished quality of the work. The problem I face as teacher is one of where to I lay the emphasis and weighting when I mark the work? Is technical ability to be rewarded the most or creativity and imagination? The truth is, as a teacher, you would probably like to have both in a piece of work. I have often designed marking rubrics that give a sliding scale of grades for both qualities. This way you can at least make clear to the pupils that you are interested in both areas. But a recent workshop on differentiation in the class has set me thinking in a different direction. The workshop focussed on the fact that within any given class you have pupils both with a range of abilities but also with a variety talents or skills. This would certainly seem to be the case in the example I have described above. My own feelings are that pupils who lack a certain dexterity in the way they use their materials (even if their ideas are imaginative and ambitious) generally get short changed during this early stage of secondary education. Greater emphasis on specific judgment criteria in a marking rubric certainly goes some way to helping in this area, but in a way I would like pupils to look even more critically at the work themselves and in doing so identify for themselves their own strengths and weaknesses. In order to try and reach this goal I am considering adjusting my marking for a couple of forthcoming assignments. My plan is to continue using a marking rubric to produce say, two grades that are marks out of ten, one for technical skill and one for creativity and imagination. These two scales will be accompanied by the normal descriptors explaining the sorts of standards in both areas I am looking for. The difference though would come in allowing the pupils themselves to decide what the overall weighting between the two grades should be. They could decide for 50–‐50, or 30–‐70 for example, anything up to a maximum or perhaps 20–‐80 or 80–‐20. Obviously I would ask them to make the decision for the weighting before they get to hear the grades that I have given the work. The whole point of the exercise is to get them to look critically at the strengths and weaknesses in their own work and to help them to identify areas where they could improve and to give them the feeling that they are able to be rewarded for areas that they are successful in. I’m not sure how often I might use this approach to marking, at this stage it is very much an interesting experiment. However, I would be very interested to hear from anyone who has experimented in similar ways. I am of course also interested to know and see for myself if it has any effect on the qualities of the work pupils produce. Since early May this year I have been working on a large scale artwork for a research institute in the Dutch town of Nijmegen. I have never had the chance to work on such a large scale piece of work knowing that the location for it has already been decided. The finished work is close to four metres in width (over twelve feet if you prefer!). The three panels are based directly on earlier completed paintings although the new versions gave the opportunity to refinement and further development in some areas. Most of my paintings are essentially quite small. So the chance to work on such an expansive scale has been technically interesting although more so in the area of actually seeing how ideas that worked well on a more intimate scale would scale up. The the paintings show a stretch of bleak landscape that reaches across the panels in combination with bending geometry of the coloured walls. The graphic sharpness of the geometry has been increased from the smaller versions, heightening the tension of the edges of the walls where they meet the sky and where the birds appear to disappear ‘behind the sky. The ‘ordering’ in the landscape isn’t quite what it would’at first seem. Is it actually a landscape that we are looking at? Or is it a sort of ‘décor’, scenery or film set? Is this the tranquil scene that it at first might appear to be? Where are the birds flying too? I’ve been documenting the process of development over the last months in a series of photographs. I’ve been doing this mostly for myself, but the short film does give an interesting insight into how these paintings come together in a series of steps. Yesterday I worked together with twenty three twelve year old pupils and two of their teachers (thanks Roderick and Wap!) on an long (8 hours!) and intensive art and language workshop day. For the children this was just the start of their second week at secondary school and perhaps more significantly the start of the second week where these Dutch school children are getting most of their lessons taught to them in English. This was the reason that I was brought in to lead the workshop. As a native speaker of English I can provide a kind of immersion day where all the pupils hear is English. It’s a big language challenge for the children, and for me something of a challenge too as I try to hold back from allowing a single word of Dutch to slip out! We hear a lot about short spans of attention in the children of today and such a day as yesterday kind of puts that theory to the test a little. The children are more used to switching from one activity, subject, teacher or classroom at regular intervals, how will they cope with being in one room, with one project and one project leader (supported by a couple of others)? Well on the experience of yesterday I would say just fine. Yes the overall project was broken down into a number of smaller parts. This is important for boosting and re-boosting the energy and focus of the class. Also important is that they could see what they (as a group) were achieving, this is undoubtedly a luxury of an art project, but a quality that surely can be simulated in other subject areas. But above all, the opportunity not to be continuously interrupted by the school bell announcing that the class must clear up and move on to their next lesson offers new chances for ambitious work and prevents so much time being wasted in the day. Don’t get me wrong, I don’t think we should do away with the fragmented timetable of ten or twelve different subject areas, but I would certainly be a fore stander for more occasional project days, as long as the lesson material, plans and teaching are strong enough to maintain a greatly extended lesson. Points one and three are obviously very desirable elements of this sort of teaching strategy. The second one sounds rather less positive. Although as an adult who has learnt to speak a second language since leaving school this kind of ‘joining up the dots’ in speech is a skill I remember being so important to me. It is about having the confidence to make little conceptual leaps to link up elements of content when sections of language interpretation are missed for whatever reason. Put me in a noisy environment, where everyone is speaking Dutch and I still find myself having to consciously try to do this. It’s about the idea – a start-up lesson with thanks to Rauschenberg! Regularly I use a start-up lesson with my third years (age 14-15) that I know leaves them actually discussing the content of the lesson beyond the moment that they have left the room. The lesson plan could hardly be simpler. Hand out a piece of paper to each pupil and make sure that everyone has got a pencil and a rubber. Next, ask the pupils to take a collection of small items out of their bags or pencil cases and arrange a still life on the table in front of them. We then spend the next thirty minutes producing first a line drawing and then adding shading on and around the objects, I encourage them to try and make it the ‘best drawing that they have ever made’! After thirty minutes I ask them to switch drawings with the person sitting next to them. I think most of them expect to be asked to carry on working on their partner’s drawing. 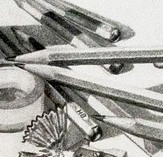 But then comes the twist, I ask them to rub out the drawing, completely erase it, or at least as much as is possible. It’s so interesting to watch how different classes react to this. Occasionally I get one where they just shrug their shoulders and get on with it. With most though it is a mixture disbelief and uproar, with some it almost becomes disobedience with some of them refusing to be so destructive! But in the end I persuade them to all pick up the eraser and get on with it. 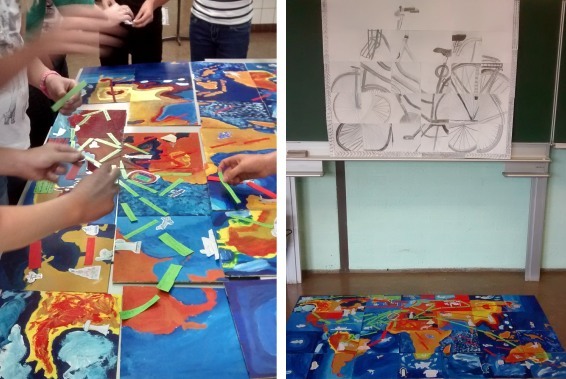 In order to explain this rather unusual practical lesson at the start of the year and link up with the learning targets listed above I explain how this all connects up with what Robert Rauschenberg did to a Willem de Kooning drawing back in 1953. 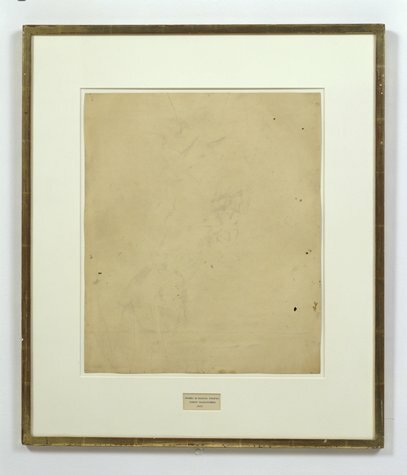 Rauschenberg spent two months gradually erasing the valuable de Kooning drawing before framing it and exhibiting it as his own work with the title ‘Erased Willem de Kooning Drawing’. For a more extensive explanation to the story click here. 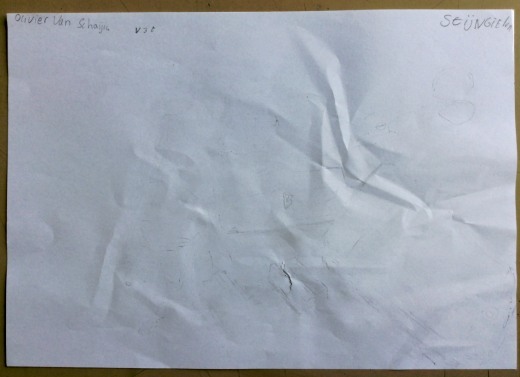 Below you can see one of my pupil’s pieces of work. In the end it is quite a lot to take in, but a series of themes have been established that can be returned to during other lessons and lesson modules. I normally end with a promise never to ask them to erase their work again!